Before you can use your Opticon barcode scanner you will need to install the Bestway & Batleys Barcode Uploader software. This small piece of software makes it easy to add products straight to your online shopping trolley. Follow the instructions on screen to install the software. 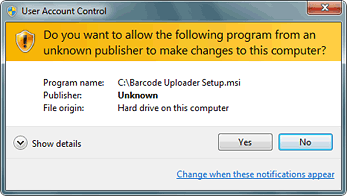 You may see a prompt like this asking if you want to allow the program to make changes. Click 'Yes'. You may see a prompt like this preventing you from running the installer. If so click 'More info' then 'Run anyway'. Once the software has successfully installed you should see a new taskbar icon in the bottom right corner of your desktop. If you can't see it the icon may be hidden – click the up arrow to reveal more icons. switch to the Desktop to see taskbar icons. The first time you run the Barcode Uploader software you will be asked to enter your customer number and password. You can also choose whether or not to remove barcodes from your scanner after uploading them to your online trolley. Note: to change these settings later, right-click the icon in the taskbar and choose 'Configure account and settings'. Having scanned some barcodes, connect your Opticon scanner using the supplied USB cable. A window will pop up showing the number of products scanned. Click the button to upload your order and you will be taken to the Wholesale website where you can import the products to your trolley. Windows 8 users: switch to the Desktop to see the status window and build your order. Click the taskbar icon at any time to retrieve barcodes from your scanner again. Right-click the taskbar icon to bring up a menu of additional functions. If the software doesn't detect your barcode scanner, try disconnecting it from your PC and then reconnecting it. Windows may install device drivers the first time and the software won't work until those are installed. Check that the green light on your scanner is illuminated when connected to your PC. If not, try plugging it in to a different USB port. If nothing happens when you press the large button on the scanner it may need charging. Plug it in to your PC for a while and try again. If you are still experiencing problems please contact us for support.